Finally, a fry pan with a fitted lid! Finally! After asking around and exploring my options I finally got the Self Reliance Outfitters - Pathfinder Folding Skillet with Lid Setm and let me tell you I'm just thrilled to finally have a pan with a good fitted lid to make not only my fabulous hash browns but just about anything else you want a good sturdy fry/saute pan for. This skillet is 8" in diameter. You can cook four half slices of bacon at a time. So it takes several batches to cook a quantity. 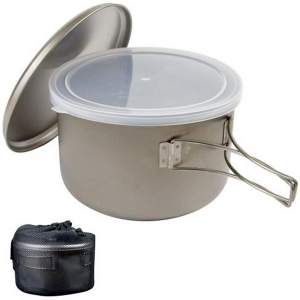 The pan's lid though is what sends this item over the top. The lid fits beautifully. 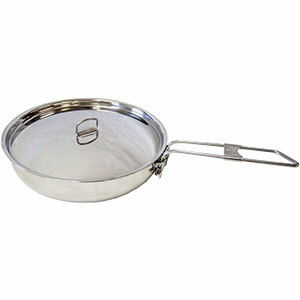 It has the same heft as the fry pan in being sturdy stainless steel. It has a divine D ring on top with enough tension that it stays in whatever position you place it in. 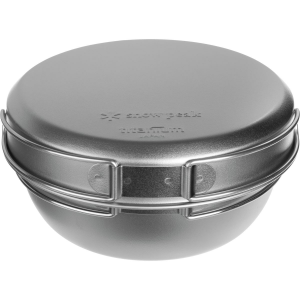 The lid is ever so slightly domed so the whole pan can be used as a dutch oven if you so chose to do so. The bottom of the pan has a thickened surface that makes for good even heat distribution. The folding handle lets you tuck the handle under the pan for storage leaving the pan open to nest bowls or other items in. The folding handle locks into place with a simple slide that can easily be manipulated with one hand. Now back to that fitted lid... It fits snuggly but you can readily lift it. I use a fork tine when it's hot or silicon pot grabber. The lid allows you to brown your potatoes for hash browns and then reduce the heat and let the potatoes finish by steaming them for those perfect mealy insides and crispy outsides that make them perfect and heavenly yummy! I did scorch a few rounds of bacon in the pan while getting used to it. 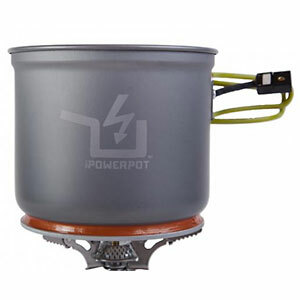 The scorch marks come off easily with steel wool pads once home from camping but did not hinder performance while out camping. My pan looks well used and I'm fine with that. I've taken it on two trips totaling about 12 days in all and won't leave home without this pan in my kit from now on. 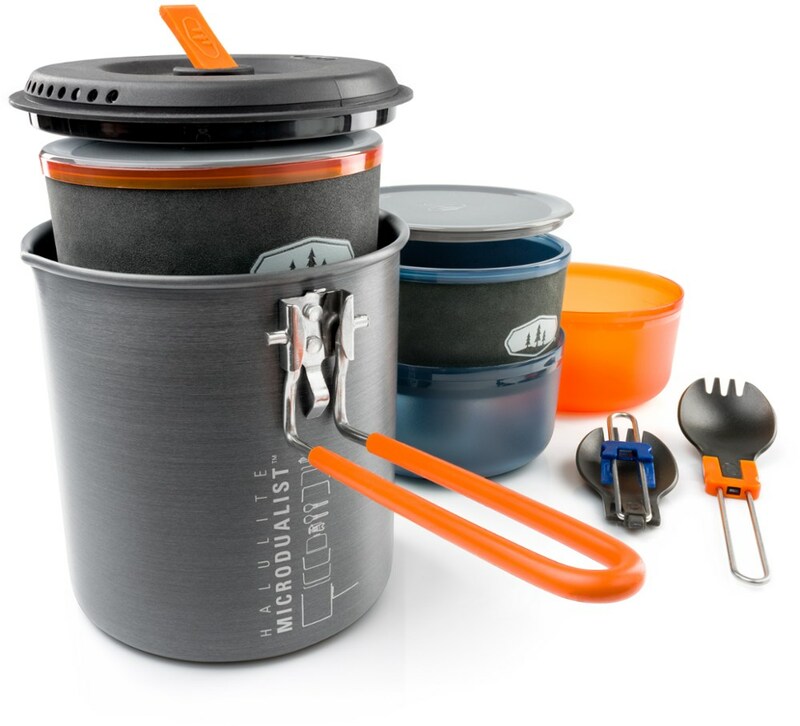 Unless I work my way up to a backpack trip, then sacrifices will be made, but as long as I have room in the jeep this is one item that stays in my cooking kit! OK, so to make this not only about hash browns I will include that this pan has seared salmon wonderfully, served on a bed of caramelized onions with tarragon. The pan also will sear up a lovely steak on command. I've dry toasted bagels and made breakfast scrambles too! I love this pan! Oh and when I don't need the lid? It sits at the side and becomes my spoon and spatula rest! I hope this helps anyone searching with the same dilemma I had of not finding a good pan with a fitted lid. Oh and a side note about the scorching... well, I usually use cast iron at home sooooo yeah, I always have to remember to not over preheat my pans and use lower heat anytime I use stainless steel. It's entirely my fault each and every time. And the rest of my home pans are copper bottomed stainless steel, so you would think I would know by now! Thanks for reading and have a fabulous day and happy trails to all! Great review, Myra! Thanks for taking the time to share it. Now I'm hungry for some hash browns! Great review... I'm hoping if they don't make a 10 inch model that someone will. 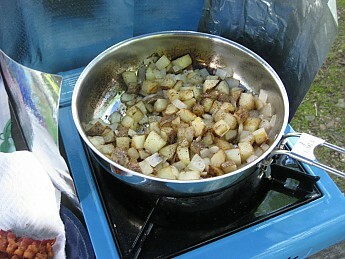 I do a lot more car camping now than Backpacking these days and love the idea of this item over a cast iron skillet. Both size and weight are issues when camping out of a Jeep just like it is when BPing. Again... great review! Hey Hersh, I feel the jeep camping pain! It's not glamping but you so have to watch what you take to fit into a jeep versus any other vehicle. People just don't understand how we tread between light and space and comfort because we are camping from a vehicle! Happy jeeping! Thanks a bunch for this review. I just ordered one for us. Thin pans are fine for soups or even double boiler style baking and cooking or just making tea but you need a thicker bottomed pan for direct cooking. 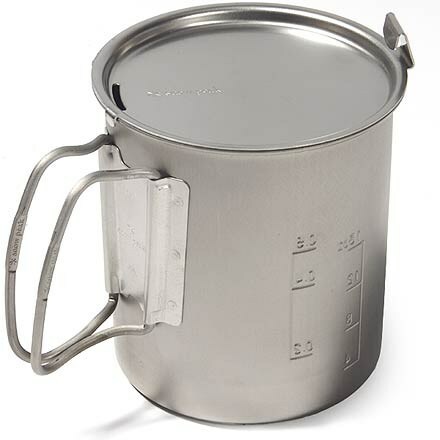 Like you and most experienced cooks, I find a lid essential for every pot and skillet. You get more even heat dispersement, saves on fuel and indeed makes a more succulent and moist dish. 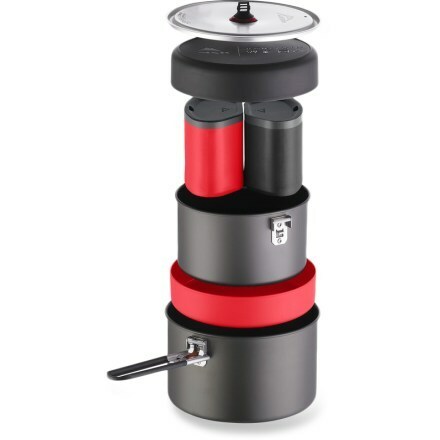 The Self Reliance Outfitters Pathfinder Folding Skillet & Lid Set is not available from the stores we monitor.